Nomad Webbing | Getting you out of trouble when you need it most! Getting you out of trouble when you need it most! What a busy show season we had, last year (except for the ones we missed due to the poor ol’ Land Rover needing some work!). And this year looks like it’s going to be even busier! We’ve already been to the 4×4 Expo, and have a full season ahead of us. Will we see you at any of the shows? The Spring Overland Adventure Show on 28th & 29th April. Malvern Land Rover Show & 4×4 Spares Weekend on 2nd & 3rd June. The Billing Off Road Show on 30th June & 1st July. We are planning our shows for this year, and have a few lined up. We have already been to the Donington 4×4 Show, and the line-up for the rest of the year is looking good. 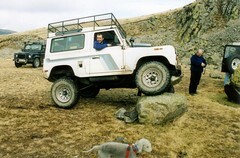 The Great British Land Rover Show on the 23rd April. The Classic Land Rover Show on 6th & 7th May. Malvern Land Rover Show on 3rd & 4th June. The Billing Off Road Experience on 28th – 30th July. The Adventure Overland Show on 23rd & 24th September. And The Great British Land Rover Show again on 26th November. We may book some more shows nearer the time, so keep an eye on the events section of our Facebook page for updates, or tell us what shows you will be going to. Hello everyone! It’s been a while since this was updated, so I thought I would let you all know what we’ve been up to. It was decided that the workshop could do with a re-paint, but when plaster started falling off, bricks started coming out of the wall, and rotten floors collapsed, we knew a full refurb was needed. It took a while, but the place was gutted and re-built. We’re still finding homes for things, but that’ll be an ongoing process. We’ve also got telephone and internet operational, so we can spend more time here working on emails and on the website. That’s our winter project, so hopefully it’ll be running properly before long. We’ll still be about, over Christmas. We hope that you have a good holiday, and don’t get too stuck in snow! After a long year with many setbacks, including a death in the family, we’re back and ready to do what we do best, make the best straps on the market. Over the next few weeks we will be updating our shop with more information and our latest news. We’ll also be contacting clubs with our latest offers. As always, let us know what you think…. All of our products are hand-made in the UK, and not by automatic machines. A skilled machinist makes every strap and watches every stitch, to make sure the highest quality is achieved. Why not follow us on Facebook or Twitter for all our latest news?